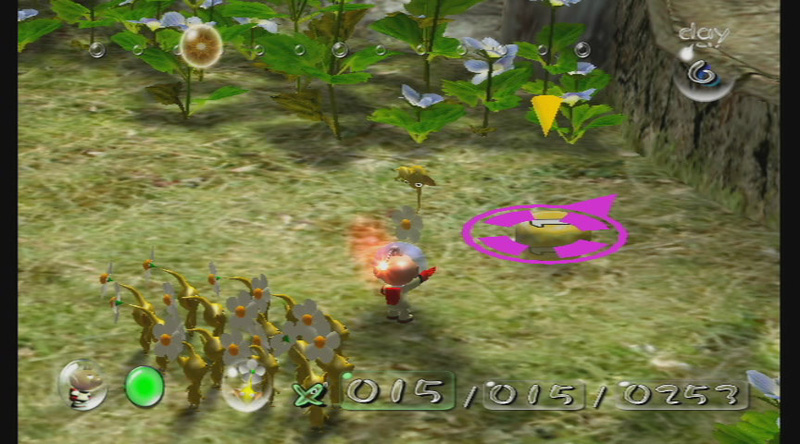 Pikmin are strange and colourful little plant-like animals that Olimar stumbles across at the start of the game. They grow in the soil next to their onions (homes, for those of you not native to the Pikmin universe), and are more than glad to help Olimar find the missing parts to his ship. They come in three variations: red (fireproof), blue (water tolerant), and yellow (bomb rock wielding featherweights). On their own, they may not pack a punch, but together they are formidable opposition for any of the planet's nasties that get in your way. You see, as a result of their immense bravery when facing enemies, Pikmin are prone to suffering from quite an unfortunate side effect- death. To keep the populous turning over, Olimar needs to help the Pikmin find pellets and fallen enemies that, when taken back to an onion, will grow more Pikmin seeds. Without growing reserve Pikmin, the game can get quite tricky, especially when you encounter creatures that can destroy more than 50 at once! 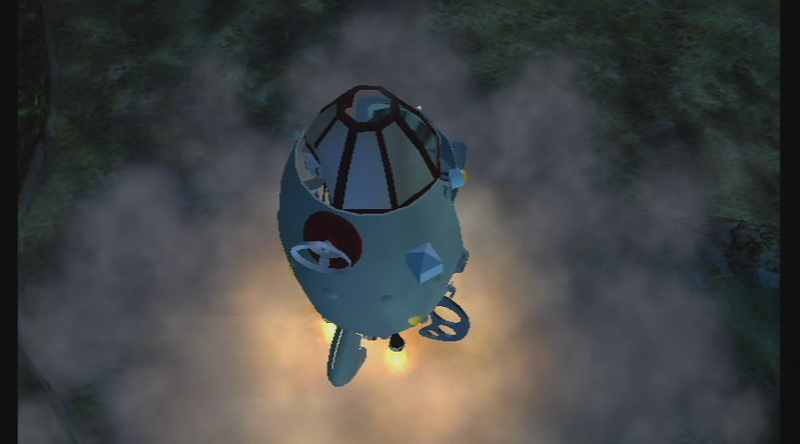 So, providing all your Pikmin haven't been gobbled up (or got themselves lost/ set on fire/ drowned), you'll be searching for your ship's parts. Retrieving most of these wont take you too long to figure out- the solutions are fairly simple…Simple, that is, if time was on your side. You see, our bulbous nosed captain cannot survive for long in the planet's atmosphere- 30 days is all he has to get all the ship's parts and leave. Depending on what parts are retrieved, there are three endings on offer, including one where our intrepid space adventurer never makes it off the planet! 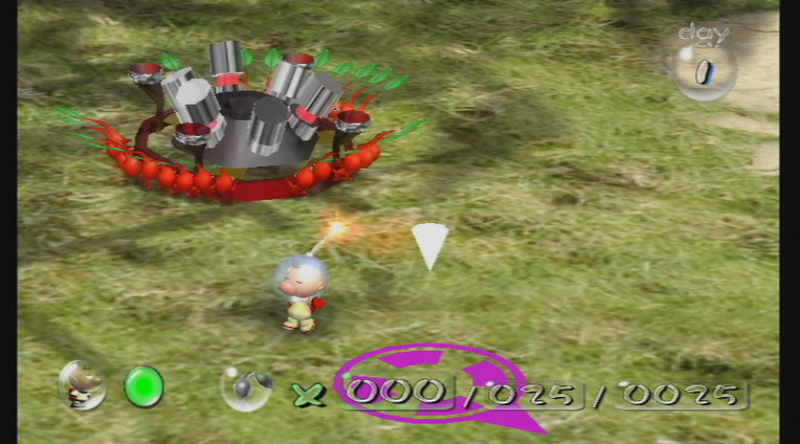 As if things weren't bad enough, Olimar can only perform his search for parts during the daytime- if it turns to night whilst Pikmin are away from base, then it is lights out for them, quite literally! So not only do you have to think things through, you also have to be fast about it. 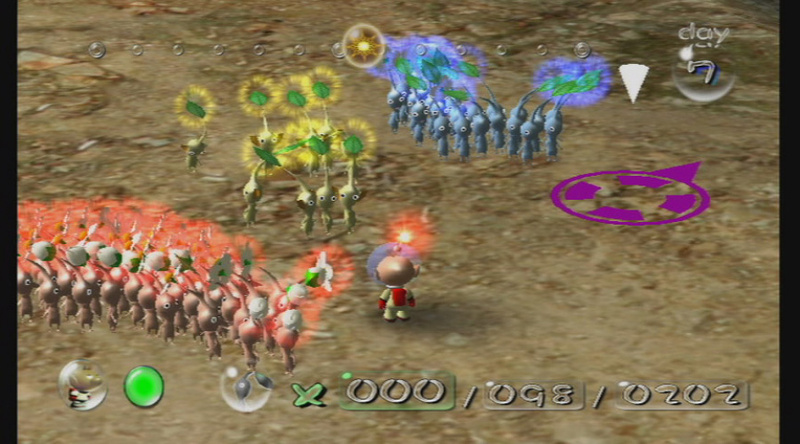 In total there are only five areas to explore- two of which are exceptionally small- so the story is over fairly quickly, but that's not a bad thing because the replay value is immense: you'll always strive beat your highest score, and the challenge mode- where you try and grow as many Pikmin as you can- adds further incentive to keep playing. 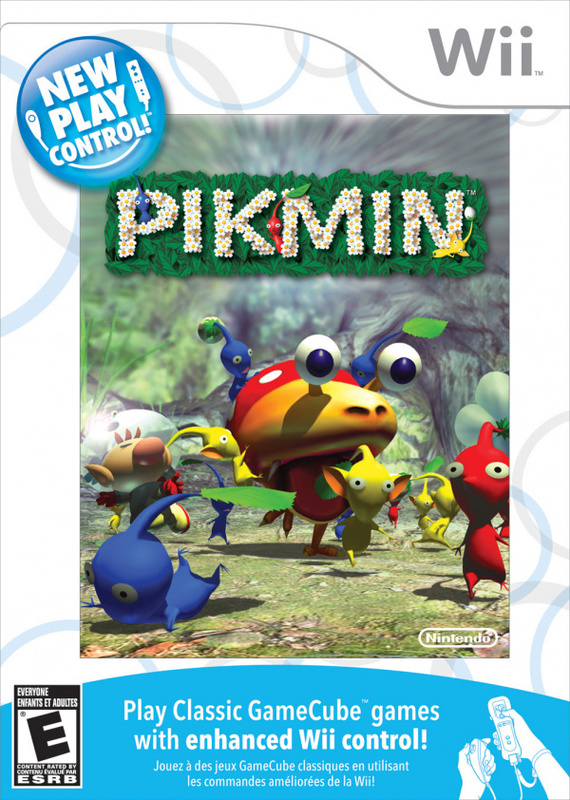 I'll finish with my take on the “New Play Control" feature… To put this simply, the Wii feels designed for Pikmin: the controls are effortless, intuitive, and make playing the GameCube version feel like swimming through treacle. Point, click, done. That's really all I have to say- they work, very well! Along with the controls, the graphics have had a slight adjustment too- things look smoother: everything scales up well on large televisions, but it doesn't push the Wii's capabilities- it does what is expected of a port. Pikmin is a quirky, innovative, colourful, charming, and addictive game- epitomising exactly what Nintendo are all about. Sure, it's just a GameCube port with Wii controls slapped on, but it works well. The only downside to the Wii version is the lack of extra content- it would have been nice to see some more levels or gameplay modes to justify the price tag. If you've never played Pikmin before, it comes with my highest recommendation. If you have, you'll still enjoy it, although it might be worthwhile to just wait for the superior Pikmin 2. Sounds awesome! I look forward to owning this and the sequel as well. Waiting for Pikmin 2 Wiimake. I will get this overtime but I am more looking forward to the Pikmin 2 Wii version because well... that game just frankly rocked. I really enjoyed this game. I would much rather see Nintendo doing new and interesting stuff like this on the Wii than bowing to fan pressure and making sequels to existing franchises. I certainly agree with you on the front that Nintendo should focus on making new and interesting titles. Sometimes though, if done well, a series can have continual innovations in each iteration. I'm interested to see if Nintendo release a 3rd Pikmin game- one specifically designed for the WII, rather than a GameCube port. The potential there is pretty awesome. I think Nintendo have to find a nice balance between milking the cash cow and creating new IPs. As long as Miyamoto is on board, I have no real worries. Pikmin 3's already in development, we just haven't heard about it in quite some time. Maybe this year at E3? Can't wait to play both Pikmin 1 & 2 for the first time. Just bought this game, and I only partly regret it (only because I should be saving money for this school year). The Wii controls for this game work great! I just got this game about 3 hours ago its the best!!!!!!! 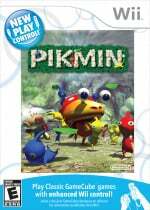 Pikmin did get a 9/10 on Gamecube. Its no longer high in originality as it was back then. I would like the New Play Control games to appear on Wii U eshop in the absence of Gamecube support. I'm sure NPC Pikmin 1 & 2 are still worth playing after Pikmin 3.